According to a poll commissioned by the Good Food Channel last year, the average British woman can cook just seven meals from scratch, with eighty percent admitting to churning out the same thing over and again, and only two percent turning to cookbooks or online for a source of inspiration. I don’t know about you, but as a member of that minority percentage, my problem is less how to get out of a cooking rut and more deciding what to make next from the ever-growing reams of recipe ideas accumulating in print, online and in my head. Dip the flapjacks lengthways or vertically . . . Cooking the same recipes day in and day out is a little like putting on a pair of pajama trousers: easy, familiar and an almost ritual guilty pleasure. If we were to continue with the clothes analogy, I suppose having a blog is not dissimilar to attending a public premiere: everything should look amazing, all eyes are on you and heaven forbid you be seen wearing (posting) the same thing more than once. Blogging has really opened my eyes to all the exciting recipes out there, whether reading other peoples’ posts or coming up with ideas of my own. However much as I enjoy looking things up online, it’s hard to beat the look and feel of a proper printed cookbook. Whether it’s brand new, pristine from its packaging and screaming for the gorgeous glossy photos within to be brought to life, or a dog-eared tome, pages turned down on family favourites or smeared with buttery fingerprints, there’s something about cookbooks that completely captivates me. But there are only so many hours in the day, and try as I might to use all my cookbooks in regular rotation, there are some I turn to time and again, and others (whispers) that I’ve never managed to cook from at all. One such book is – or I should say was – Heston at Home, a present from my brother this Christmas just gone. Having asked for it specifically, when presented with the pages of fancy foams, sponge-filled cheese toasties (!) and other weird and wonderful tips and techniques, my brain simply refused to engage. The photography wasn’t quite as enticing as I’d hoped, the recipes required various odd pieces of equipment I didn’t have and somehow poor old Heston ended up at the back of my bookshelf. On Monday we arrived back in London after a blissful family weekend away in Yorkshire. With rain lashing at the windows, thick grey clouds slung low in the sky and my body only just beginning to come out of a chocolate Easter-egg induced coma, it felt like some lazy baking should be firmly on the agenda. Trawling the cupboards I laid out oats, flour, sugar, honey, an open jar of natural peanut butter and a bag of dry roasted peanuts. With butter and a squeezy bottle of condensed milk from the fridge, I was set to make one of the easiest recipes ever, so to spend a little more time in the kitchen I decided to tackle something from Heston’s book. 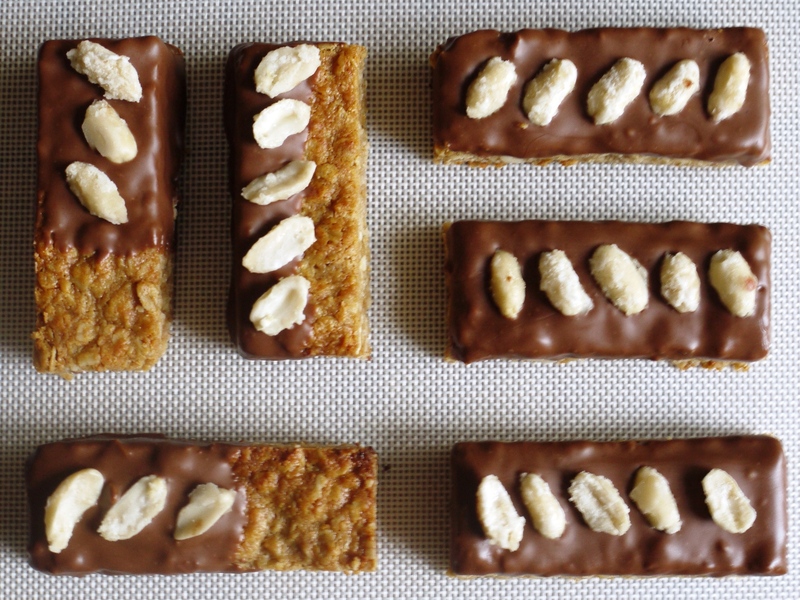 Creamy chocolate, chewy oats & crispy peanuts – what more could you want? The recipe below involves crystallized peanuts. In Heston at Home, the photograph shows pistachios, the green, jewel-like nuggets coated in a lacy white layer. My peanuts are a little less pretty, looking more like the salty crust of a slightly underbaked potato, but ignore the slightly anaemic appearance and they taste absolutely delicious: nutty, crisp and crunchy with a salty-sweet kick. The crunch of the nuts against the smooth milk chocolate and sweet, fudgy flapjack works wonders and elevates these from a basic after-school snack into something much more exciting. If you’re looking for a healthy flapjack recipe, look away now. Or better still, have a look at the sesame and tahini flapjacks I posted at some point last year. 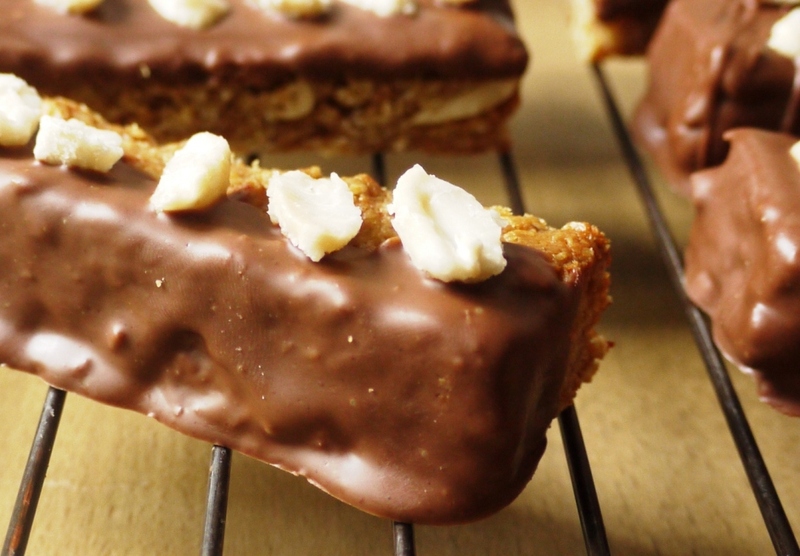 But if you’re looking for something rich, mellow and seriously satisfying, packed with toasty oats and crispy, crunchy nuts, then this is the recipe for you. The chocolate coating is entirely optional, but is a great way to use up any bits of leftover Easter chocolate (really? No, me neither), and the crystallized peanuts are (hopefully) something new to try. After all, you wouldn’t want to get stuck in a recipe rut, would you? 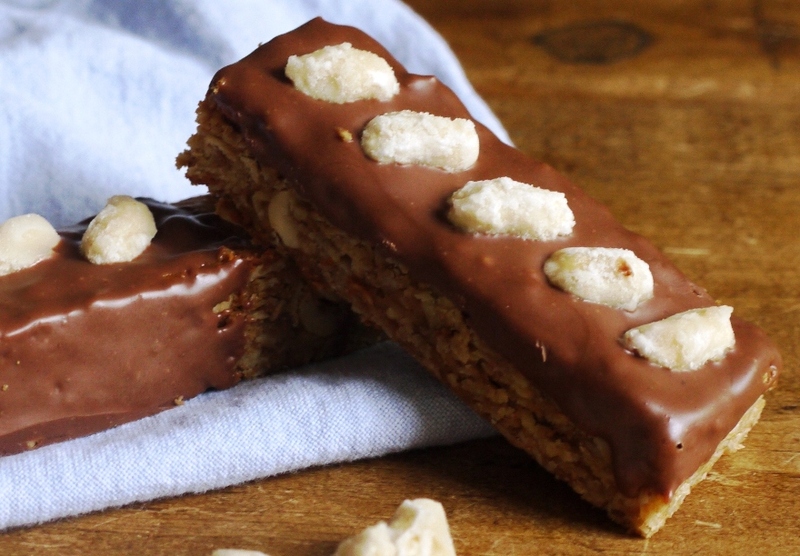 These nutty, chewy, chocolaty flapjacks melt in the mouth . . .
Preheat the oven to 180 degrees C. Grease and line a 20cm square tin. Melt all the ingredients except the oats and peanuts in a medium saucepan over a low heat until combined. Remove from the heat and stir in the oats and peanuts. Transfer to your prepared tin, smooth the mixture flat and bake for 20-25 minutes, or until lightly golden. Remove from the oven and allow to cool completely before cutting into 10 bars. Line a tray with non stick baking parchment. Combine the caster sugar and water in a medium pan and bring to the boil over a medium to high heat. Continue to boil until the syrup at the edges of the pan begins to colour, then remove from the heat and add the peanuts, whisking until the syrup has completely crystallized and coated the nuts. Melt the chocolate and peanut butter together in a small pan over a low heat, stirring constantly. Add a little oil until you have a thick, glossy spread (this final addition isn’t entirely necessary but gives the chocolate a lovely sheen). Dip your flapjack bars into the chocolate mixture one at a time, then lay them out on your prepared tray, a few centimetres apart. Top each one with a few crystallized peanuts. Once the tray is full, pop it in the fridge for 30 minutes to allow the chocolate to firm up. Serve at room temperature, and store in an airtight container. Oh YUM!!!!!!!!! These look amazing and I could really go one right now for afternoon tea with a huge mug of tea….mmmmmmmmm!!!! You are so inventive and clever! You’ve definitely made flapjacks look very stylish. They are usually so delicious, but plain. Nice to see them get some love. I’m tempted to try making these. They look easy. I have a terrible history with flapjacks having made some that were so bad the local birds wouldn’t eat them. I need my hand held apparently. just the antidote to a busy dayyesterday that I was looking for, am going to try these this afternoon ….. Thank You! These look absolutely beautiful. how neat and perfect are they? Sometimes it is a bit like that with some books. You think you are going to get all inventive and then you hear those crickets! I love a good flapjack, especially one that involves chocolate in some form! I totally agree. Although I’m still an amateur and tackling all the classics are my first go to list, I would want to amaze myself and the family with more crazy recipes. It’s true that the familiarity, the comfort zone is enticing, but I love new, I love untried, untested! It’s amazing to think that the average British woman can cook just seven meals from scratch. It’s also a little sad. My move into food blogging certainly opened my eyes and increased my repertoire, and I just love trying new recipes. I think with the ever increasing popularity of cooking shows on tv that the number of meals people can cook from scratch is increasing. I’m also guilty of having cookbooks in my collection that I’ve never cooked from either. I’ve never had flapjacks, but these look amazingly delicious. Wow, those statistics are pretty horrifying. I’m so glad I can cook! I can’t imagine eating the same meals over and over, and not having the skills to do otherwise. Sad. Flapjacks are obviously something quite different in the US–they’re breakfast pancakes–but that just made all the chocolate a welcome surprise! Choc Chip Uru – I’m not sure I’d recommend these for breakfast! I didn’t realise in America a flapjack is more like a pancake…very different in the UK! Jennifer – you’ve never had flapjacks?! That you have to remedy 🙂 As for the statistic, I know, it’s so incredibly sad. Although, as you say, with the growing popularity of food on TV, in magazines and online, the situation does seem to be improving. Lisa – until I wrote this post I never knew that flapjacks in America were pancakes! 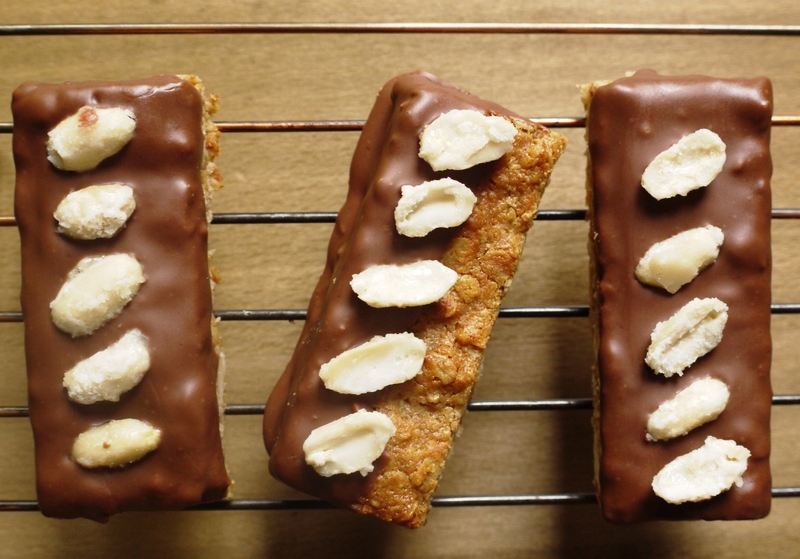 In the UK it’s our standard name for a baked oat bar. I’m super-duperly (probably not a word I know) impressed with your Heston recipe! And they look super-duperly (here we go again) great! And as for the fact that ‘the average British woman can cook just seven meals from scratch’- fact of the day that is!! Ooh Peanut butter-y stuff!! mmmm! I guess I have just found the recipe for my weekend baking session. Thanks! Seriously, I live my life in a constant state of stress as recipes accumulate in my ‘bookmarks’ section and in my recipe journals, cut out from magazines. I genuinely worry that I will never be able to make them all in my lifetime. It’s a big concern. I’m surprised I don’t have high blood pressure. On another note, these look like the most unhealthy thing ever. I bet they taste amazing. wow o wow all my favourite ingredients!! I do tend to cook the same few recipes over and over again but since I’ve started blogging I tend to bake something new each time. 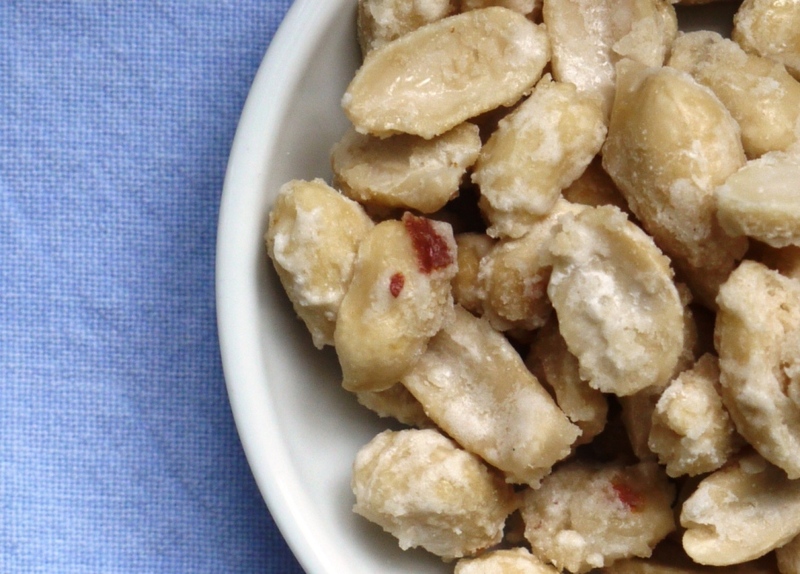 Totally loving the crystallized peanuts – yum! Oh Pinterest has ruined my social life 😉 lol I love it!! These souns ah-maz-ing! Wow, these look delicious. Love the dipped milk chocolate coating… what a perfect combination. I could use one right now (that is also the exact reason they are so dangerous…)! Oi You Food – enjoy! Elly – I don’t think they’re that unhealthy… 😉 I know what you mean about recipe overload though – if I stopped saving them right now I’d probably still have enough new recipes to last me several years! Baking Addict – do try the peanuts – or you can use this technique with any nuts, so yummy! Nic – haha, I know, Pinterest is so addictive. I have accumulated such a collection of recipes over the years that there is no way I could possibly ever cook my way through the pile! I do think that the process of collecting them has it’s purpose however even if never made as they serve as a source of inspiration. I’m an old fashioned girl at heart, so I know what you mean about the charm of a cookbook. There’s nothing quite like it. Sylvie – totally agree, every day I find inspiration in new recipes. Lay The Table – I think everyone has a guilty stash of recipe books they’ve never used, however big or small. Kaliegh – I can’t get enough of them, even though I could probably find all the recipes and more online! Sam – thank you and I agree, a million times better than shop bought. This is my first time to this blog. Those look delicious. Yummy and I will be back. I do a lot of creative baking, but when it comes to dinner, there’s definitely a rotation of meals I work through. This is inspiring me to pull out my cookbooks and break out of the rut! Connie – ah, thank you! My girls love peanut butter. This would be a very special treat for them one time. They look amazing. Lemon Fire Brigade – ah, thank you. Glad to have revived your love of flapjacks!